Supplies exceptional protection against the effects of high winds and driving rain and includes a damper flap to help reduce back drafts. Manufactured with UV stable materials to reduce colour fade. Fits direct to components with 100mm i.d. connections. Overall size 154mm x 154mm. 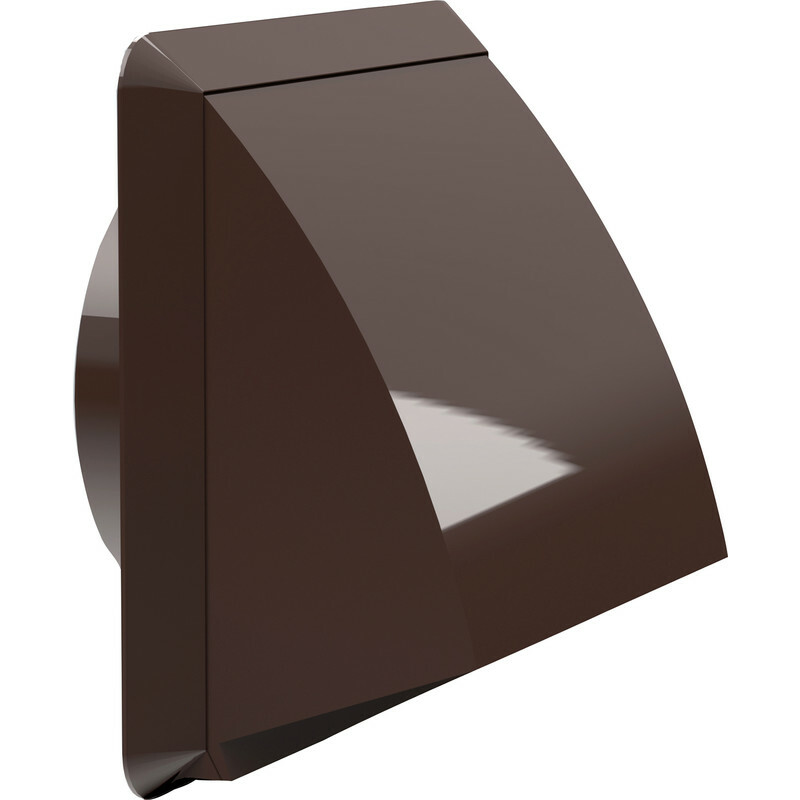 Round Ducting Cowled Outlet Brown is rated 3.9 out of 5 by 24. Rated 5 out of 5 by Stumpy6 from Good looking vent cover Fitted this to replace old cracked cover, easy to fit. Rated 5 out of 5 by Ninal57 from Sturdy and works well The vent installed when the house was built last year allowed the Beast from the east to blast cold air into the kitchen through the cooker hood. When the cowl is assembled correctly there is not a problem with the flap binding. The clips that hold the hood onto the unit are tight, which is a good thing once installed but they do need a bit of pressure to locate. Rated 4 out of 5 by Rottidog from Does the job but flimsy In common with some other reviewers the first one we were sent had a smashed wall plate - it was packed smashed as there was no damage to the package but they sent out a replacement. For that reason I dropped a star from the rating. The cowl needs to be snapped sideways into the lug once fitted to allow the flap to move freely and it works well for a tumble dryer outlet. Rated 4 out of 5 by bejay60 from Good value I have purchased a few of these recently and they are good value for money but they are always a little out of shape and require a little bit of tweaking before fitting. Does the job at a good price. Rated 4 out of 5 by StigOfTheDump from Robust and quieter than others .... that's not to say it's silent when the wind gets up though. You may find a little foam excluder on the flap useful. Rated 5 out of 5 by penelopepitstop from Good price. Decent quality. I made the same mistake as others, thinking that the plastic had buckled. If you look on YouTube, you will see that the curved sides are a design feature - when you have fixed the base plate, you position the cowl and press the sides outwards to click the tabs securely in place.